This is Part 2 of my Organic Gardening Series, Garden Planning. I’ve included a link to my garden plan, as well as a nifty seed starting timeline for folks in my hardiness zone! Today I’ll go over my earliest phases of garden planning, which I do before I even start my seeds. The level of planning that you do can vary, but after a few years of winging it, I’ve decided to try planning things out a bit more. I’ve got my seeds, and I’ll be ready to start some of them this week. As you can see, I have a good mix of flowers, fruits and veggies. Now that I’m going to be getting a CSA share, I’m planting fewer fruits and veggies, but more flowers. It’s always difficult to get an exact estimate of how many seeds to start. Last year I went a little crazy with seed starting, and my seedlings did really well; there were a LOT of extra plants. I crammed more transplants into my garden than I had planned for, and even then, I still had leftovers. But after the flood, many of my community garden friends needed to replace some of their tomatoes and other vegetables, so I was able to give all of my extras away. How much food do you have space for? Not just in your garden, but in your home as well. How many people are you trying to feed? What will you eat or use the most (try to be realistic). First, you should calculate the square footage of your garden. I have 175 square feet of garden space. Then I like to get an idea of how much will fit into my garden. If you’re like me, and tend to plant things fairly close together, you could refer to a Square Foot Gardening resource. You can also choose to focus on a few important plants, and give them lots of room to grow. Next, take a quick survey of your pantry and/or freezer at home. If you have a lot of space, and aren’t afraid to jump into a canning, dehydrating, or freezing project, then by all means- plant as much as you can! If you’re like me, and have a limited amount of space and experience with canning, then you need to put a bit more thought into your plan. Second, think about how many people you will be feeding with your garden. Also, what do they like to eat? If only one person really likes beets, it’s probably not a good idea to plant a lot of them. Lastly, be realistic. Think about the vegetables you want to plant, and how much of each you’re likely to use. I like to try out new and interesting vegetables, but if it’s your first time growing something it’s probably best to only plant a few. Remember that harvest time is usually pretty busy, and you will likely have a huge amount of veggies to put up all around the same time (this is especially true in Minnesota where we have such a short growing season). I grew Quinoa last year, and I was really excited about it at first. Then I didn’t have time for threshing and winnowing the grain. Oops. I used the Mother Earth News Garden Planner to get an idea of how much I can fit into my garden. It’s a great piece of software, and anyone can sign up for a free 30 day trial. Here’s my plan, complete with a list of my vegetables and a handy timeline for when to start, transplant, and harvest each thing! Awesome, right? Keep in mind, this is NOT my final garden plan. I still have to take companion planting and crop rotation into account. I will probably do this in a few weeks, once it’s closer to the time I will be starting to plant cool weather crops in my garden. 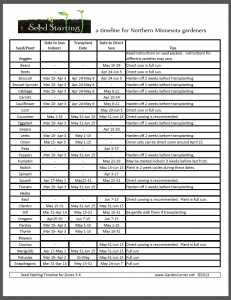 Most cold climate gardeners are gearing up to start their seeds, so I’ve attached a handy Seed Starting Timeline that I created for anyone living in between zones 3b to 4b. The dates were calculated using an average last frost date around May 31st. We’ll get down to the nitty gritty of seed starting next time! I recommend reading some of my previous posts to get ready! 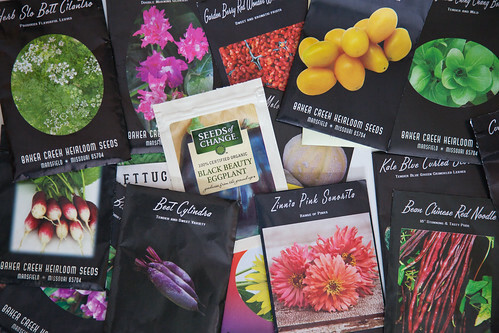 You can order your seeds if you haven’t done so already, and find some quality seed starting soil. Both are very important to having healthy seedlings to put in your garden! Next PostVacation Photos: Tulum, Mexico!